You’ll Have to Take a Seat After Seeing Our Incredible Dining Room Chairs Range! Modern interior design styles vary greatly, with some popular dining room trends including retro, contemporary, French and wooden. 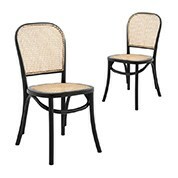 With such a variety of tastes being out there, MyDeal has endeavored to offer the widest range of dining room chairs. From adventurous leather dining chairs to comfortable upholstered dining chairs, our range truly spans it all. Blach, white or grey dining chairs are all provided at MyDeal, as well as some more out-there colours and designs. 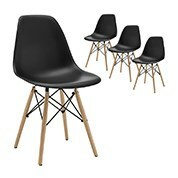 Replica Eames chairs, cafe dining chairs or timeless dining table chairs for your home can all be found at MyDeal. Thanks to our extensive range of products, you are bound to find something that fits your budget and brings out the best in your dining room. Choosing the right furniture for your dining area is of the utmost importance, as this is where you’ll be hosting stellar dinner parties and will, of course, want to ensure your space is presentable. When browsing MyDeal’s range of dining table chairs, your only difficulty will be settling on just one style that you like! Aside from being a stylish addition to your home, dining room chairs also need to be comfortable. After all, your family will spend three meals a day on these chairs, and any dinner parties you host will require guests to be seated for hours as they dine and drink. 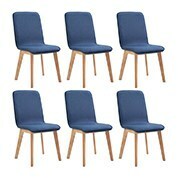 Functionality, durability and comfort are therefore MyDeal’s top priorities when offering dining chairs to our guests. From dreamy fabric and upholstered dining chairs to durable wooden ones, any preference can be met at MyDeal. Business owners should also look to MyDeal for comfortable and stylish dining room chairs, as our products will ensure your customers receive a great first impression of your business and enjoy their time there. In order to complete your dining room, you’ll of course need a variety of other dining and kitchen pieces. MyDeal offer a complete selection of contemporary and classic dining room furniture perfect for homes, restaurants, bars and cafes. This includes stylish bar stools, elegant dining tables and entire dining sets for those who don’t want to stress about mixing and matching! Complete your stunning dining room today with MyDeal’s range of dining room chairs and other dining room furniture.